I was surprised to realize that I had yet to post an image of Spring. Life has been unusually busy recently and Spring didn’t just arrive – it exploded into life. It was a case of ‘blink and you missed it’. But, I did get out with a camera, although not as often as I would have liked. I think we all have different approaches to the changing of the seasons. How do you define Spring in your photography? Is it the burst of colours – as flowers and blossom bloom? Is it the greening-up of the landscape? Or is it in the detail? 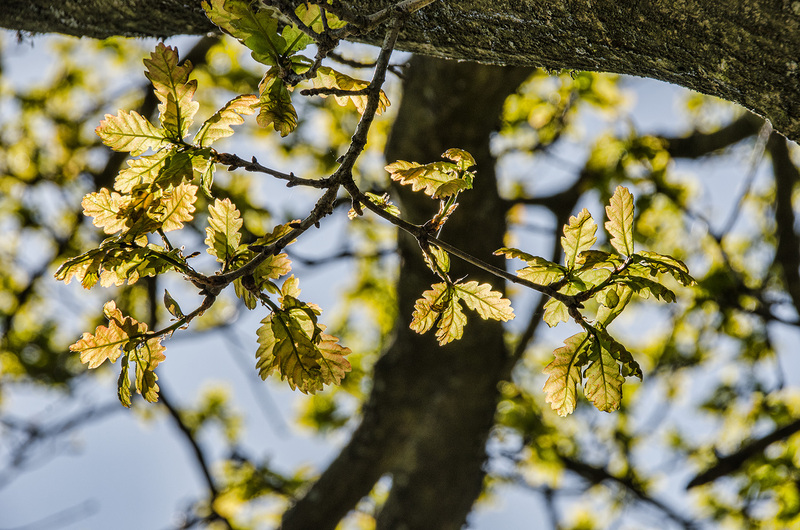 For me Spring (and Autumn) is defined in the detail – the single leaf, or a small bunch of leaves. I see beauty in their translucency, the colour variations and the vibrancy of those colours. All too soon the subtleness of the palette of greens and yellows is lost. The colours become homogenized and the greens lose their brightness and start to look tired. Remember to click on the image to see a higher quality enlargement. This entry was posted in Microscapes, Spring and tagged Canopy, Leaves, Photography, Spring. Bookmark the permalink. This is a gorgeous picture. I like what you said about the 180 degrees. One has to be in a state of calm to really take advantage of such a scan. But sometimes it brings amazing results. Thanks Shimon. A state of ‘calm’ is so important to us as photographers. I try to remember that the world around me exists up, down and all around me. We miss so much if we merely look ahead and from side to side at eye level. Yes – beauty in the detail. Thanks Paula. I couldn’t agree more with what you’ve written, Andy. And what a nice photograph to show us what you mean! The leaves appear to me to be almost metallic, which is a little odd given their translucence. In any event, it’s a gorgeous photo, both in color and in detail. We had a two-month spring this year, and now it’s simply gone. I’m certainly regretting its departure: facing into the light won’t be nearly so pleasant for a few months! I know what you mean about ‘metallic’. I think it is a consequence of the newness of the leaves. Spring is all too short; this year here in the UK it exploded over the course of about a week – quite bewildering. The temperatures have swung wildly and plant life has suffered. Beautiful detail in this shot, Andy. Well done! I’m not sure I would say the greens begin to look tired, but I agree with you about all that glorious detail, the freshness of the yellow-greens, and the loss that seems to be so sudden. Yes! Look towards the sun and see that transparency, and yes, if only we had two months of it, or even one. Well, maybe we have one here, but I’m greedy. Lovely, thoughtful post, thank you. Thank you so much Lynn. I know from your own work how well you see the landscape (especially forest) in detail. It’s been a very strange Spring, late and sudden and I feel I’ve missed it, due to other pressing events and preparing for two speaking engagements. I mustn’t let that happen next year! I often felt that way when I was working long hours, so much regret….but last year, my first spring being retired, I went crazy and ran around everywhere, mainly looking at flowers. This year, I’m a little more subdued, and we’ve thankfully had a cool spring. I’m happy spending whatever hours I do spend outdoors. Sometimes, life gets too busy, but we take our opportunities where we can, as I know you do (like London!). Thanks Lynn. I’m in my tenth year of retirement and life seems so busy at times. I don’t know where the times goes sometimes and days seem to get swallowed up so quickly. But the consolation and the real ‘plus’ of retirement is that there is always tomorrow (at least I hope there is!) and the pressure is off. No more deadlines, no more keeping to time. The idea of carrying a camera at all times means that photography becomes a part of every day life, it’s a constant of life. And that’s different from the idea of dedicating ‘time’ to photography.